Iowa has lost just one game by more than five points this season (an eight-point defeat at Michigan). Rutgers has not won a road game all season, and are just 9-13. In the final 15 seconds of the Weber State/Sacramento State game, there were three technicals and two three point shots…the final play a 75 foot swish by Dylan Garrity of Sac State. We may have to wait until the post-season to see Xavier Thames of San Diego State---but it will be worth the wait…17.9 ppg, 42.7% from the field, 43.2% from three, 82,4% from the line and 1.8 steals per game. When Baylor plays up to their talent, they are a dangerous team. Still, they are 2-6 vs. the KenPom Top-30. Clemson got an unsexy win against Georgia Tech (45-41) without anyone in double digit scoring. Iowa is 1-6 vs. the KenPom Top-20. Bobby Portis of Arkansas scored 35 points in the win over Alabama. No other starter scored more than four. 19 straight for San Diego State. Virginia makes just 64.8% of their free throws…319th in the nation…remember this in March. Six of Syracuse’s victories have been by one or two possessions. UNC has won five of their last six. Since Michigan lost All American candidate, Mitch McGary, the Wolverines are 12-1. Georgia State has won 13 in a row. 14 Straight for the Gators…16 consecutive 20-win seasons, 4th longest in NCAA right now. Two wins in a row on the road for Ohio State. 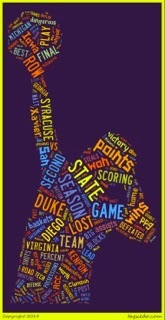 Looking back, there were a season’s worth of highlights in the Duke/Syracuse game. Duke has won 29 in a row at home. Against Wake, Duke had 17 assists on 27 made baskets…picked up 30 points in 58 bench minutes. Duke is converting 41.6% of their threes…best in the ACC and second-best at Duke since the shot was instituted in 1987. Oregon has lost five of its past seven game…and doesn’t really have post players. Virginia leads the ACC in scoring defense (55.5 ppg). Clemson is second at 55.8 ppg. In the victory over Notre Dame, Syracuse made 21 baskets…11 by Trevor Cooney. Xavier has lost three in a row…four of past six. Delaware has won 12 in a row. Virginia Tech has lost eight in a row and 10 of its last 11…haven't been defeated by fewer than 20 points in two weeks. Kentucky’s Willie Cauley-Stein had 18 points, 11 boards, 6 blocks against Ole Miss. In his six previous games he totaled 14 points, 19 rebounds and nine blocks. Shazam! Wichita State is shooting just 33.5 percent from beyond the arc in Missouri Valley play, eighth in the league. UConn’s Shabazz Napier is averaging 17.9 points, 6.0 rebounds, 5.7 assists, and 1.9 steals while shooting 45 percent overall and 43.5 percent from beyond the arc. Iowa missed 17 of 20 3-point attempts while losing at home to Ohio State. Kansas is the most dangerous team in the country when Alan Wiggins shows up. Florida, San Diego State and Cincinnati are probably the three best on defense so far this season. Arizona State’s Jordan Bachynski had five blocks last night and is now the all-time Pac-12 leader. SMU is 7-1 in their last eight games. Cleveland State and Oakland combined for 29 3-pointers last night. Stephen F. Austin has 29 consecutive home wins…tied with Duke for nation’s longest. Miami is the slowest team in America with 58.7 possessions per game. According to BPI, six of 11 most difficult schedules (and eight of 16) belong to Big 10 teams. Six different coaches in the Big 12 have Final Four experience. Boise State blew a 15-point lead in the second half vs. San Diego State…and an 11-point lead at the 3:29 mark at UNLV. Villanova had 25 assists on 32 baskets in their victory over Xavier. Not so fast: Kansas has 12 Top 100 wins, eight in Top-50, #1 Strength of Schedule, #1 RPI. One more thing: The ACC (Duke & Syracuse) and the Big East (Villanova & Creighton) are the only conferences to have at least two teams in the top-ten RPI and KenPom. Congratulations!!! You made it to the end. Celebrate by watching some college hoops over the weekend.